cecilia quinteros born in 1985, buenos aires, argentina. she has developed her language as a self-taught improvising cello player. since 2007 she has co-created many experimental music projects in argentina and worked with theatre, visual artists, contemporary and butoh dancers. 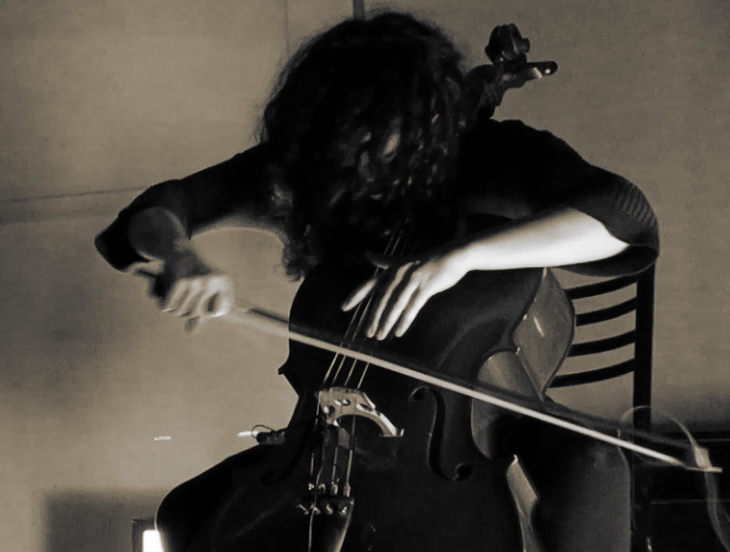 she also composed and premiered cello quartet pieces at the 2009 and 2011 editions of the tsonami international sound art festival in buenos aires. in 2010 the athens arts ensemble (MeQ) commissioned her to compose a piece which premiered at athens concert hall. in july 2013 she was invited by the danish record labels ilk and barefoot records to perform several concerts at the copenhagen and aarhus jazz festivals. she spent the next year and a half playing concerts in different groups at clubs and festivals throughout denmark. she has played with the musicians: lotte anker, dror feiler, paal nilssen-love, sture ericson, koichi makigami, sabu toyozumi, kesten osgood, nils bo davidsen, maría faust, martin küchen, hearn gadbois, among many others. she performed solo cello concerts in argentina, brasil, italy, denmark, germany, austria and czech republic. her current projects include ruido², YAS, rhabdoviridae, eriza, la corporación, HAITI, and a dúo w/ alex elgier.